Tagline: Home away from home. Any new student at a University struggles to find a compatible roommate to stay with during their college year. Also, when new students arrive at the local airport, they need someone to pick them up and take them to the university. Our application is a solution to this problem. 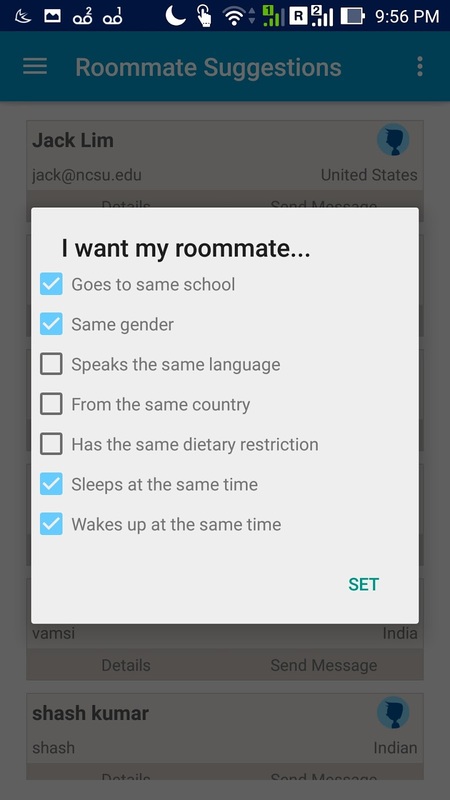 One feature of our application is that it allows students to fill out a form detailing their preferences for a roommate like dietary restriction, gender preference, sleep/wake-up time etc.Using our algorithm running in the backend, we will then match students together who share similar preferences. 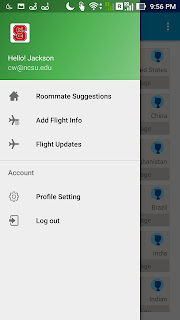 After creating an account and logging in ,you will find a list of all the students seeking roommates in your university. The preferences can be set by clicking the option at the top right corner. 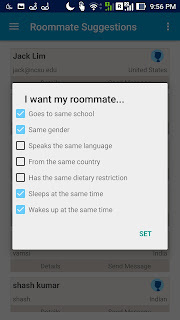 This allows students to find a roommate even before they arrive at the university. The persons displayed on the matching list can be contacted just by clicking on the send message button. This way, the new student can immediately move into their new home once they arrive. Another feature is that before even they arrive, they can find friends who are travelling in the same flight to the same University. 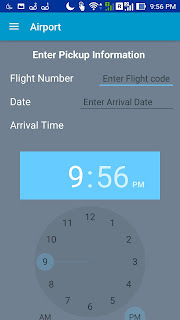 For this, the user just has to enter the flight details in the Add Flight Info page which can be found in the drawer layout. 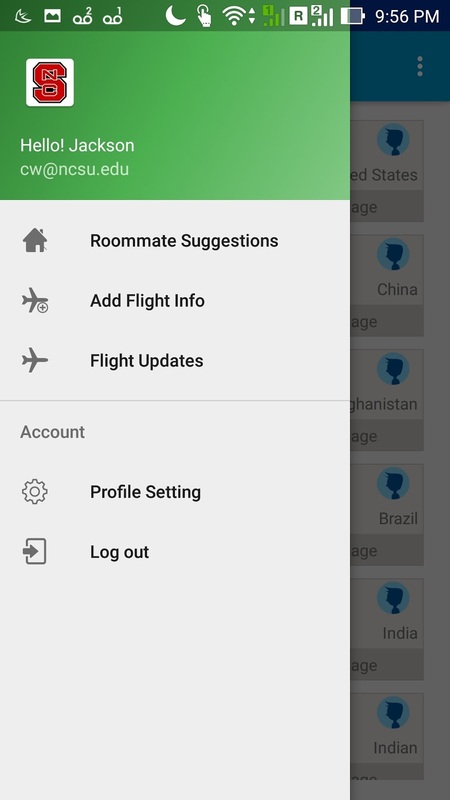 Once entered, you can click on flight updates on the drawer activity to see a list of people who are travelling in the same flight to the same University. Once they arrive, students can then request a fellow student, or student organizations to pick them up from the airport. Clean Android app following Google’s material design principles. 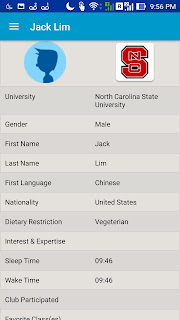 Integrating the front end of Android with Bluemix backend server with Cloudant database. Wrote efficient REST APIs for communication between backend and front-end. Resolved many integration issues that came along our way. Collaborated and made the app work efficiently. Published the app to the Google Play Store. 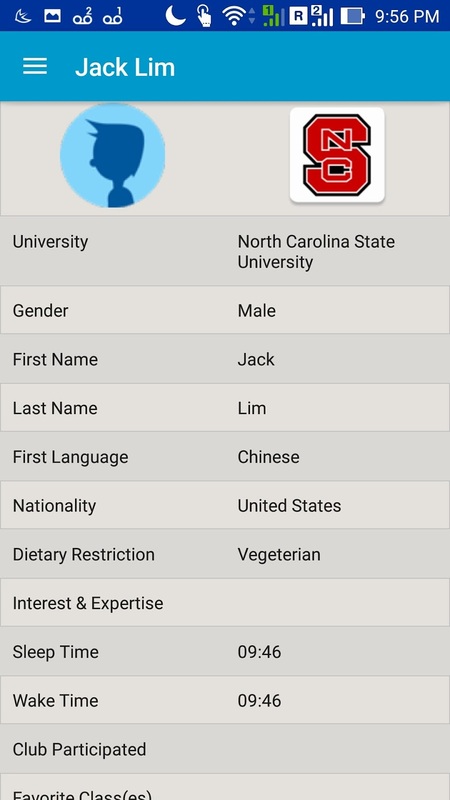 Multiple functions can be added to the application like creating groups for purposes like carpooling, grocery shopping etc. 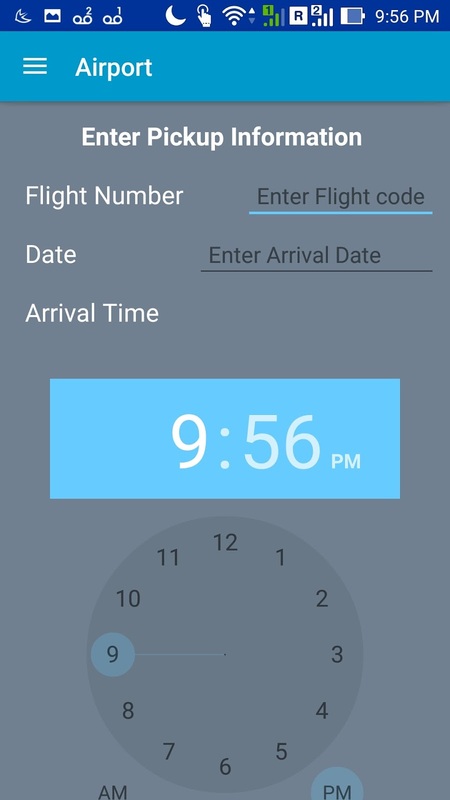 The application can be integrated with the University’s Office of International Services so that whenever a student enters the flight info, the flight information is automatically pushed as an e-mail to the office so that they can arrange someone from the University to pick the students from the airport.